The Local Government of Jagna thru its Tourism Office in cooperation with the Jagna Sustainable Micro Enterprise Development (JaSMed) is conducting a 2-day Practical Local Tour Guiding Training on August 30-31 at the Looc Barangay Hall. The seminar is in preparation for the program “A Day in Jagna” tour package which will highlight the different culinary practices of the town. Resource person is Ms. Angelie Tiu, a Jagnaanon and a former municipal councilor, engaged in the business of tour guiding. 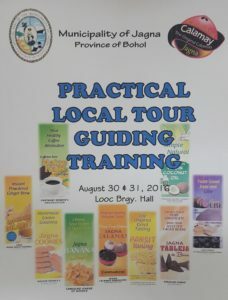 The 2-day program includes presentation of the Vision of the Jagna Tourism Industry by SB Committee Chairperson on Toursim Councilor Maricris V. Jamora; What is Tourism by Ms. Teresa Gina Ranan, Tourism Officer; Overview of the Dynamics of Tourism, Tour Guiding Seminar, Mock Tour for Culinary Tour on the Jagnaanon products Calamay, Tableja, Banana Chips, Ube, Pancit Yaning ang a tour of the Public Market and scriptwriting will be tackled by Ms. Tiu.